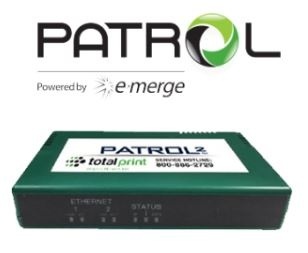 PATROL™ is a self-contained appliance that monitor’s copier/printer output with one convenient device, securely and effortlessly. It was designed by TotalPrint’s in-house R&D Department to automatically monitor print volumes on both network and locally attached devices- desktop printers, digital copiers, and multi-functional devices. If the output devices detect low ink or toner levels, it alerts us to ship replacement cartridges that same day. There is no software to install and no security risks. It's even used in the Department of Defense. What this means is that you will never run out of toner, never have to stockpile toner, and you will always be informed on how to better manage your expenses.